Departing from Waianae (rather than Waikiki) promises a lesser-seen view of O'ahu and plenty of marine life. 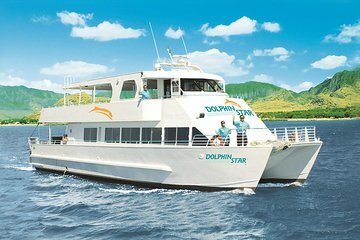 Este crucero de observación de delfines de Oahu parte desde el puerto de Waianae, lo que permite a los visitantes experimentar un lado menos visitado de Oahu. Con las elevadas laderas del monte. Ka’ala se eleva por encima de la costa y surcará las aguas en busca de grupos de delfines hawaianos. A diferencia de las ballenas que migran en invierno, los delfines son residentes de todo el año de Hawai y se ven comúnmente en la costa. De hecho, las poblaciones de delfines son tan constantes en la orilla de sotavento de Oahu, que los avistamientos de delfines están garantizados en esta excursión ecológica de Oahu de dos horas. Escanee el horizonte en busca de salpicaduras y aleteos y delfines saltando en el aire, y los hilanderos hawaianos pueden hacer siete giros en un salto poderoso. Los naturalistas certificados brindan lecciones a bordo sobre las diferentes especies de delfines de Hawái, y una presentación en video ayuda a educar a los keiki (niños) sobre los delfines aquí en Hawái. Después de encontrar una manada de delfines salvajes y observar sus emocionantes salpicaduras, prepárese una hamburguesa gourmet en el buffet de barbacoa a bordo (si se selecciona la opción). Para obtener información adicional sobre la historia de West Oahu y los puntos de interés cultural, seleccione la opción de transporte adicional desde los centros turísticos de Waikiki o Ko Olina. Fantastic! We saw whales as well a the Spinner dolphins which are only found in Hawaii. the crew were really friendly and fun. We also took this tour last year and it never disappoints! They always make sure they find the dolphins even if they have to go all the way to the end of the island!!! The staff is also very friendly and knowledgeable. Boat clean and staff very friendly. We did get to some dolphins but felt, the trip was too short for the price. Wow! The ship was clean, the staff was friendly and the scenery was awesome! We had several opportunities to see dolphins and sea turtles in their natural habitat. It was a beautiful day! We say lots of dolphins and a mom and baby whale! wonderful day with the whole crew! Very good, although I felt the actual sightings of dolphins were a little limited not enough time was spent with the dolphins themselves. But crew was professional, courteous and service was excellent. Terrific. Captain and Crew were very friendly and professional. We boarded the catamaran at 10 a.m., road to a spot where dolphins are known to frequent, found a group of dolphins, and followed them for 30 min. We ate hamburgers at around 10:45 (WAY too early in my opinion). Then we were back to shore by noon. Overall it was okay. We saw dolphins! Lunch could have included more than a burger and condiments. Dolphins were nice but trip went much quicker than anticipated. The crew was nice, but there was a small craft advisory; I wasn't sure if the tour would go on. When the bus picked us up, I figured that they know what they're doing. 90% of the guests became ill due to rough seas. We should not have gone on that tour, and the captain should have known better.